The home of the Mary Thibault Fine Art Gallery. The new hot original art gallery on Bay Street in downtown Beaufort South Carolina. The Thibault Gallery features the finest group of artists in the Low Country where all the work is "Art by Southern Hands". Come visit us and friend us on face book to keep up with events here in our working vibrant art gallery. 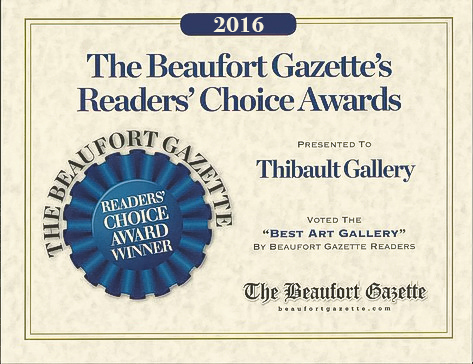 Welcome to the Award Winning Thibault Gallery! This gallery is a haven for talented artists to showcase their art, as well as an attraction for tourists and locals alike. Here you will find original art in a variety of mediums, from oil paintings and water color paintings, to fine art photography. Watch our artists at work. You can commission a one-of-a-kind piece or take home something that fits in your bag. From large wall art and giclee prints to note cards and postcards, we have it all. You will always find just the right gift for someone special, or that perfect artwork to make your room complete. We welcome you to stop in often as we will always have new and interesting things. Thanks for coming, enjoy your visit! Join us for a virtual tour of our gallery! We are honored to have been chosen the "Best Art Gallery" in Beaufort, SC for the fifth year in a row by the Beaufort Gazette's Readers Choice Awards. The Thibault fine art gallery presents the the art of Mary Thibault and other leading artists of the low country. Authentic art created by Southern Hands is the theme in this contemporary art gallery as well as working resident artists practicing their various disciplines. Opportunities - Calls for Emerging and Established Artists, Photographers.